A gay Mormon has penned a powerful response to his bishop after the LDS church threatened to excommunicate him for being gay. 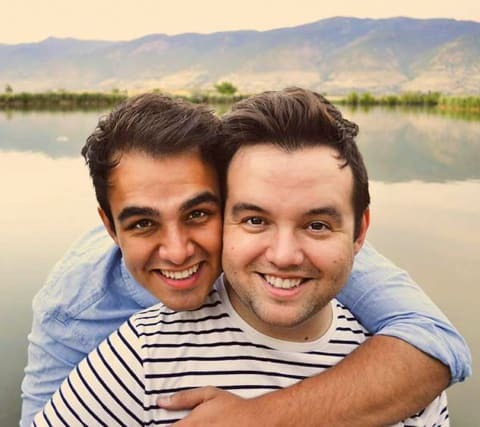 Utah native Taylor Knuth-Bishop (above left) and his husband, Sean Knuth-Bishop, were among 33 couples who married at the 2014 Grammy Awards during a performance of "Same Love" by Macklemore. 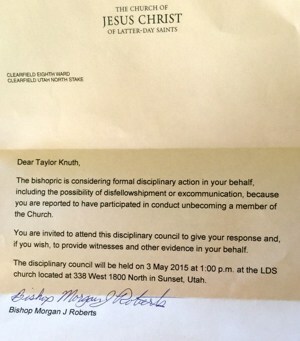 "The bishopric is considering formal disciplinary action in your behalf, including the possibility of disfellowshipment or excommunication, because you are reported to have participated in conduct unbecoming a member of the church," Roberts wrote. "On the telephone Bishop Roberts repeatedly used the word 'Choice' to describe his reason in calling the disciplinary council hearing, and that this choice could potentially lead to my disfellowshipment or excommunication from the Church. I have CHOSEN to marry Sean Bishop. It was my CHOICE to live the lifestyle I live. That was among the vocabulary used to describe my situation." 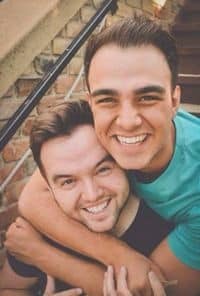 Knuth-Bishop posted a powerful response to Bishop Roberts, in which he talks about his love for theater and his relationship with his husband — whom he calls "the greatest thing that ever happened to me." Knuth-Bishop also tells Roberts how his family has been supportive, and states that while he's no longer a practicing Mormon, he still believes in the church's "foundational teachings of love, charity, kindness, hope, and faith–among others." "I am not afraid of who I am or who I love in the eyes of God as I see them, nor will I deny that love. To me, Jesus preached love and acceptance–not exclusivity, perfection, judgement, or fear-mongering. "I, along with my entire family and close friends, have CHOSEN to stand on the side of love, equality, acceptance and celebration." "Shame on you for calling into question a relationship that is the cornerstone of my life–that I hold above all others. Shame on you for telling me that my 'behavior' is 'unbecoming of a member the Church.' Shame on you for not honoring the promises that you made to your congregations to love, value, and respect each member. Shame on you for being so far away from the true lessons of Christ. And finally, shame on you for attacking me for engaging in a relationship that does you and the members of your congregation no harm whatsoever." Read Knuth-Bishop's full letter to Roberts here.